I couldn't agree more. I had heard the author interviewed on a podcast and got snared in by the AT angle. The book, however, annoyed me and I couldn't help feeling a little patronized. I don't think I was the target audience but then again who is. I had to laugh as I read this review. Your reactions are exactly as mine were. In many ways I felt I was hoodwinked by the author because the book assumed that all would go well in life as long as you know how to manage it. Life just doesn't work that way, and those things which would help you get by are already commonsense ideas that most of us have learned all our lives. The author assumes too much that others don't know as much as he does. I wanted to read more about hiking and less about "the right way to live". I, too, would have thrown the book across the room were it not that I've been reading the Kindle version! Thanks for your comments. I'm not alone in my view then! 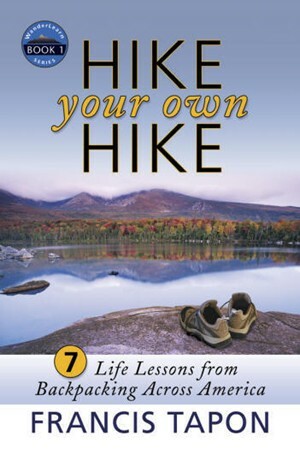 I think it's a shame as the author is obviously passionate about long distance hiking and writes well about it. I've read some of his backpacking articles and they are pretty good. I'd like to read a book about his CDT or PCT hikes. Chris, a couple of days ago this British guy posted an audioboo about my book (http://t.co/9DM3H7yV8X) and it made me think of you. Sorry for being nearly two years late on commenting on your book review. Your review doesn't surprise me at all. That's why I sent you a PDF of the book for you to skim before sending a hardcover. A quick perusal would have made you realize that it's not your kind of book. I explicitly said that I "doubt that you will like it because most Europeans don't like self-help books." I told you that I didn't want to waste $50 shipping a hardcover book to the UK to someone who is not the target market. But you insisted that you wanted to see it, so I shipped it. As an author of many books, you understand that you can't please everyone. Although I haven't read your "Crossing Arizona" book, I imagine some people would want to throw it across the room because they expected you to spend most of it talking about geology and you didn't. To which you'd tell the critic, "Well, why didn't you preview the book a bit before getting it?" Anyway, I'm glad you reviewed it because it's a good warning to all to not judge books by their cover and to take advantage of the free previews that Google Books and Amazon offer. Francis, thanks for your comment. I've tried reviewing books from PDFs and from quick perusals and I don't think it works or is fair, at least it doesn't work for me. I might decide not to read a book on that basis but if reviewing a book I want to read the printed edition. I always ensure anyone who reviews any of my books receives a printed one. I did like a fair bit of the book though and did finish by saying it was 'worth a look'. I'll look out 'The Hidden Europe'. No-one has ever criticised my books for not having enough geology in them but I have been criticised for not being funny enough, for giving too much detail, for not giving enough detail, for not describing my feelings enough, for describing my feelings too much. I've been criticised for writing about walks in the USA when I'm not American. I hope your African travels are going well.